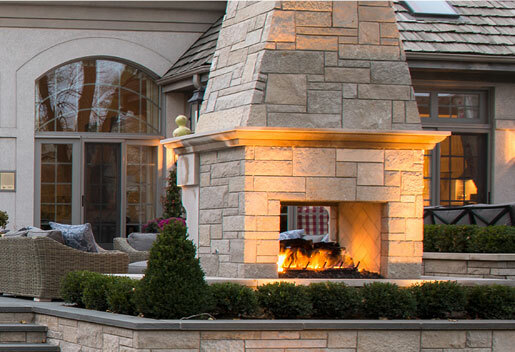 Whether you’re looking to highlight features of your home or light an outdoor living space, Premier can design a landscape lighting system that compliments the style of your home and landscaping tastefully and efficiently. Extend your day & enhance your night with outdoor landscape lighting. We consult with our landscape architects to make sure that our designs will have maximum effect on your landscape highlighting features of your home and creating beautiful depth and texture. Premier uses a hub system that reduces connections and expedites servicing should a problem arise with a grouping of lights. The hub and spoke design also allows for easy future expansion. At the end of all installations we provide clear documentation of the entire system. Premier uses, an astrological timer that automatically adjusts start times to match sunset. This way the lights always come on at dusk instead of a set time year round. This type of timer also helps significantly reduce your electricity consumption and overall electricity costs. LED bulbs use 80-90% less electricity than traditional bulbs. Like our approach to our iEcogreen irrigation system we design this system around efficiency and reducing your carbon footprint. These systems utilize LED bulbs, smaller wattage transformers, less wire in the ground, and cast brass fixtures. LED bulbs use 80-90% less electricity, which in turn requires a smaller transformer to operate. LED bulbs are designed to last 40,000 hours instead of 4,000 hours. There is less waste over the life of your system. The lower wattage also requires less wire to make the system operate or to connect all of the lamps. By using brass fixtures they are 100% recyclable at the end of their usable life. Last but not least the timing of the on/off of the system has an effect on efficiency as well. By following sunset times the system does not run longer than it has to. Properly placed lighting can give you safety while enhancing the look of the landscape at the same time. For example, putting fixtures in a tree canopy that mimics a full moon gives you added safety and is beautiful at the same time. There are many options if you are looking to add safety to your property or to illuminate walkways to your home. Lighting itself can be a beautiful addition to your property landscape. The fixtures themselves can range from modern to basic to ornate and attention getting. At Premier we want your home or landscape to be the attention grabber. Landscape lighting is a great way to highlight specific features of your garden and property. There are many different lighting techniques. There is a huge difference between the quality of materials and longevity of bulbs. At Premier we only use heavy gauge wire, cast brass fixtures, and watertight wire connections. By doing this we reduce the potential for corrosion in connections and heat which are the top two causes of premature bulb failure. Premier makes sure your system is assembled properly. All of our systems are custom for your specific yard. The transformer is sized according to your installation. This is what separates us from a system purchased at a box store and a professional lighting installation. Contact Premier to learn more and receive a free consultation with one of our landscape lighting experts. Area/Accent lighting is a style of lighting primarily used for safety, usually on pathways. In some landscapes they can enhance plant material or set a mood in a particular area. They are typically mounted on stakes or posts. The height is based on application and effect. Fixtures range from minimal to decorative taking on the style of an ornate lantern. At Premier we try to make path light as inconspicuous as possible. Backlighting your landscape can have a very elegant effect. Backlighting is where you cast a light on the back of an object. By drawing your eye to the back of a tree or planting it creates the illusion of depth. Backlighting is a great solution for short yards in an urban setting or city courtyards. Spotlighting is exactly what you might imagine; a more intense light used to draw your eye to a focal point, brighter, more intense light on a specific area of your house or landscape. Spotlighting adds drama and intensity at night. This application will bring the bark of a White River Birch alive at night or the Blue on a Spruce pop. It is a bold statement and can be quite beautiful is done judiciously throughout your outdoor lighting design like a spot light on painting in your home. 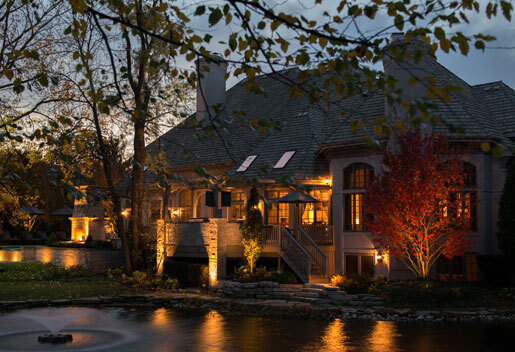 Like spotlighting, in landscape lighting uplighting adds significant drama for a beautiful and bold effect. When done properly, uplighting creates height in your landscape. We use different angle bulbs to either flood an area or narrow angle through light further up a wall. This could be seen as a version of spotlighting where the spots are positions very low resulting in dramatic shadows. This landscape lighting technique is quite literally called moon lighting because the desired effect is to emulate the color and intensity of moonlight on your home. This is accomplished by mounting fixtures at a point of 25’ plus and adding a blue lens that mimics moon light. 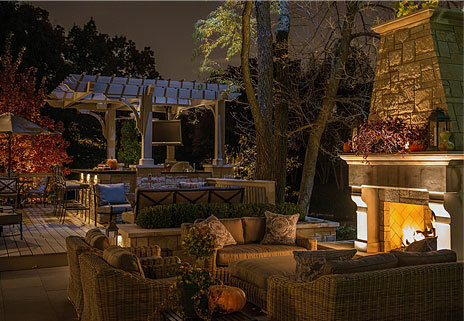 Moonlighting has a beautiful warm and welcoming effect at night especially around a seating area or fire pit. This effect is created by the use of lower wattage bulbs or lens filters. By using light sparingly it can create shadowing effect or silhouette of a focal point. Fixtures are intentionally positioned to cast a dramatic shadow from a unique plant or statue in your landscape. What better way to draw attention to the unique shape of a Japanese Maple than to create a silhouette it. Whatever your lighting needs Premier will keep your lights beautiful every season of the year. Even if Premier Irrigation & Lighting did not design your existing landscape lighting, we can maintain it. Our maintenance programs like our design and installation are custom tailored to fit your unique needs. We start our landscape lighting maintenance with a consultation and review of your existing system. Then one of Premier’s lighting experts will put together a recommended maintenance plan for your lighting. Our lighting team can also make recommendations on small enhancements to your existing system or help you change anything about your lighting system you want.